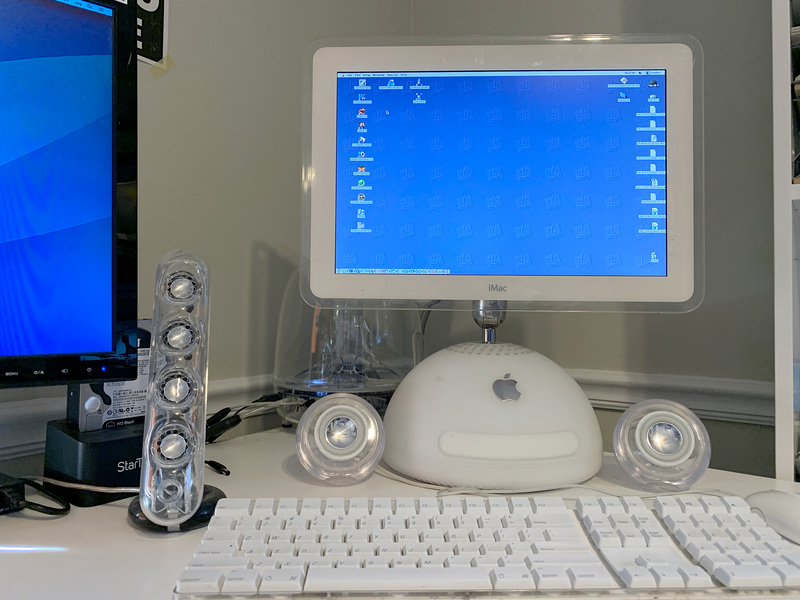 Later this week I will be firing up my 800MHz 17″ iMac G4 and use Mac OS 9.2.2 for as much of my computing as I possibly can. I love Mac OS 9 (and 8.6). I can get almost anything I need to do done fast and distraction free. And of course it’s a lot of fun! Leading up to the start of this challenge I figured I’d share some of the issues and joys of getting my Mac ready. This may be a handy guide for anyone else attempting a challenge like this. The challenge is open for 68K and PPC, any Mac OS that is not OS X but I chose Mac OS 9. These posts will be mirrored on mac-yak.com’s blog as well. Alright, let’s get to it! I have not even taken the time to clean this Mac since I got it a week ago, upgrade it or anything. Getting it all set up the way I want so I can hop on to this challenge asap! Stuffit, Toast & Fetch – To get and open pretty much every file for Classic OS, one of these apps is required. Fetch is what I use to share files between this Mac and other Macs, FTP makes it compatible with any OS. Classilla – Web browsing and email client. AppleWorks, Office – I do a lot of typing so want these around. Silverkeeper – As with every system, backups need to be in place. Silverkeeper is an excellent utility for that. Graphic Converter – I use this primarily to convert Mac OS 9 screenshots to .jpg format so I can use them on other systems. Unreal Tournament – I can’t go without for long so this needs to be present 😉 If you intend to run this and play in the PPCGL, grab the version from their server instead as it’s preconfigured with everything you need. The X-Files – Just because it’s awesome! Eject! – I’m using a keyboard that has non-functioning volume and eject keys in Mac OS 9. This utility ads an eject button to your Control Strip. Thanks to Steve for making me aware of this! Photoshop, Dreamweaver – For maintaining several websites. TimerDA – I want to track how much time I use my iMac G4 every day and this is the first utility I found. I may switch to another one if I find a better option. So far I’ve only run into a few issues that require me to switch back to OS X.
PODCASTS: Forget about playing .m4a files in Mac OS 9. These need to be converted to .mp3 first. And of course there is no chapter selection in iTunes 2.0.4. So iTunes on my Mac Pro was used to convert these files to MP3. MUSIC/RADIO: Unfortunately the radio station streams in iTunes no longer work. A real bummer because I listened to radio through that a LOT back in the day. I still have my music podcasts as mentioned above, 800+ GB of albums in MP3 format and if I feel like listening to radio I pull a stream from the internet-radio.com website. INPUT: Certain things just have to be done via the keyboard and thus a keyboard that properly support volume adjustments etc. is essential. This means my favorite keyboard (A1048 2003 Apple Keyboard) is out. Will have to find an older keyboard that gets the job done. RSS: No solution found yet. I need my RSS streams! WORK: Updating my websites is a piece of cake with Photoshop 7 and Dreamweaver MX. WordPress websites are a bit trickier so I update those from my phone using the WordPress app or on my Mac Pro. For my board repair I need boardview software which is not available on Mac OS 9 so for this I use a dedicated Mac mini. Also the tracking of repairs, making notes etc is all done in Filemaker and my database is only backward compatible with Filemaker 12. On Mac OS 9 I run Filemaker 6 so that won’t work. So for Filemaker, I use the same dedicated Mac mini. This system is shut down when my work day is over and is not used for anything else. By the way, text for blog updates such as this one is written on Mac OS 9 and then transferred over to my phone or Mac Pro to be posted. SOCIAL (non-issue): Facebook… YouTube… I can do without those distractions so I haven’t even bothered checking to see what is and isn’t possible. There’s more to life than those two platforms (though not many seem to think so). If I need it, I’ll use my phone. I have some RAM on it’s way to me so that I can max this Mac out at 1GB. I also want to open this Mac up to clean it out, if needed, reapply thermal paste and put an AirPort card and battery in. Having a dead battery is not really an issue as the Mac syncs up with a network time server right after it powers up but since I’m in there anyway, why not. I have no intention of using AirPort but have a few cards laying around so might as well use them. As more comes to mind I’ll add it to future posts but I think I’m pretty much all set! If you feel like doing this challenge with me, join us on Mac Yak Episode 13, Thursday February 28th where I’ll kick it off. let us know which machine and OS you’ll be using during the live stream.